Former US Open champion Justin Rose partnered musician and actor Justin Timberlake as he finished among the leaders on day one of the celebrity pro-am at Pebble Beach. 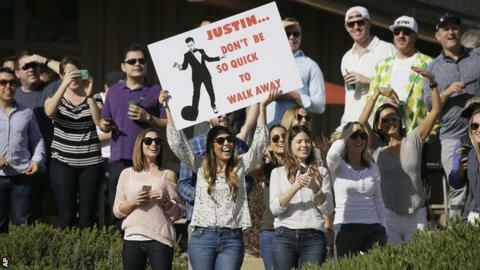 The Englishman carded a six-under-par 66 in the California tournament, which sees professionals paired with amateurs, and admitted he had been shocked at the crowd's demographic. "Everyone was under 21 and 80% female,'' he said. Rose said the highlight of his round with Timberlake came on the 16th tee, when the singer grabbed a guitar for an impromptu performance. "That was a cool moment,'' Rose said. "Not many people saw it, because there was only like 20 people back there. "That's obviously when you really appreciate how someone can grab a guitar, go acapella and sound so awesome." Actors Bill Murray and Mark Wahlberg also played in the $7m (£4.8m) PGA Tour event alongside some of the world's best golfers, who included Jordan Spieth, Jason Day and Bubba Watson. Each team plays three rounds, with the leading 25 pro-am teams and 60 professionals returning for the final round on Sunday.